The only time a Spyce Food employee touches food in the restaurant is to add garnishes and hand the grain bowl off to the customer. In a small alley off Washington Street in downtown Boston, Spyce Food Co. is preparing the lunch of the future. There are no prep cooks buzzing around the kitchen. Instead a huge machine pre-loaded with vegetables, produce, and grains dispenses measured amounts of each ingredient into a cylindrical wok, which rotates slowly alongside an electric burner before dumping the cooked meal into a serving bowl. The food is ready in just a few minutes, and the only time a Spyce employee touches the dish is to add garnishes and hand it off to the customer. 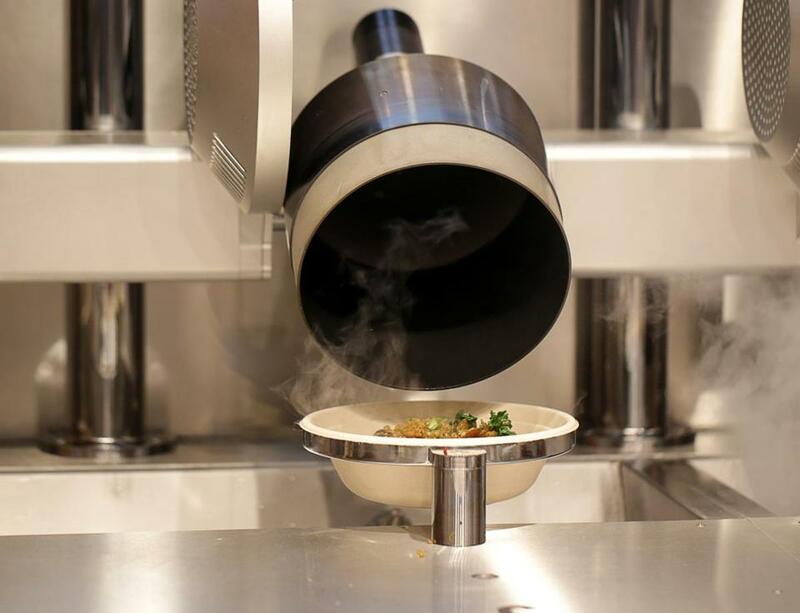 This is a 21st century take on the Automat, where robotics remove humans from much of the meal-making, and in the process, dodge the food industry’s constant struggles to find and keep good staff. Spyce is the creation of four fresh graduates of the Massachusetts Institute of Technology, who one day back in school got to talking about why nutritious, fresh meals cost so much more than fast food. Being engineering students, their thoughts inevitably veered toward a mechanical solution, a machine that could produce good meals at low cost. The result is a restaurant where humans are largely in support roles. Workers prep the food as at other restaurants, but then load it into the hoppers that automatically feed the cooking woks. At the other end of the process, pantry chefs or “garde mangers,” will add toppings, some of which — such as salmon or pomegranate seeds — cost extra. During the lunch rush, Spyce founders estimate the machine can crank out close to 200 meals an hour — with only four people on duty. It even cleans itself. Industrial techniques are hardly new in the food business. Automats — waiterless restaurants that functioned like giant vending machines with prepared food — grew into big business starting in the early 20th century. McDonald’s and similar chains are essentially assembly-line factories of food, and mechanized production is common at many processing plants. Yet through all the years, making and serving food has remained a labor-intensive process, accounting for as much as a third of the cost of a meal — and much of the headaches of running the business. The work force is often young or with limited skills, sometimes unreliable and prone to turnover. But advancements in robotics have prompted entrepreneurs and inventors to develop machines that flip burgers, steam a latte, mix a salad, even toss a pizza. Amy Webb, a consultant who helps organizations anticipate tech trends, expects more such machines in food service, as companies such as Spyce Food ride a wave of popular imagination around automation. The Spyce founders said they did not go into the restaurant business to kill jobs, but rather to find a lower-cost way to make healthy meals. “The goal of the venture is not to eliminate people, the goal is to deliver unbelievable value to the consumer, and we do that by being as efficient as we can with our operating costs,” Farid said. Farid said he didn’t know much about food when he started. He and the rest of the team asked for advice from people in the dining industry, and pitched well-known chef and restaurateur Daniel Boulud after guessing his e-mail address. Impressed, Boulud agreed to invest, and is now Spyce’s culinary director. He also connected the Spyce folks with its executive chef, Sam Benson, who worked for the restaurateur in New York and separately for Chipotle. The company started with the help of a couple of grants from MIT in 2015, the year it built its first prototype. It has since raised about $3.8 million from venture capitalists. Spyce declined to discuss the cost of its robotic kitchen concept, but it said that it hopes to open more locations if the Washington Street store is a success. The restaurant is scheduled to open May 3. For now, the Spyce team is conducting test lunches with invited guests. A basic grain bowl will cost $7.50. Customers order with a touchscreen, which kicks the machine into life. There will be two workers helping serve the bowls during busy times, and two others acting as guides during the ordering process, ready to deal with mechanical glitches. Farid said the relatively light staffing will allow the company to pay workers above market-rate wages and provide benefits including health coverage. Brita Rosenheim, of the investment firm Better Food Ventures, said Spyce’s business model sound promising, but will only succeed if people like the food the machine makes. “If it’s good, then I don’t care if a robot made it or there’s human touch there,” Rosenheim said. If Spyce’s auto-meal maker has its “John Henry steel-driving man” competitor, it is Alan Costello, a flesh-and-blood sandwich-making machine. Costello owns Al’s Cafe, a small chain of sub shops based in downtown Boston, where he said a crew of a dozen or so can crank out 800 to 1,000 orders an hour. Costello stepped away briefly from the line he operates with military discipline to talk about his mechanical competitor. While excited to check out the Spyce machine, he doubts it can match his pace.